It is an honor to be chosen by the Quinceanera to be a member of her honored court. After all it is in the title – Court of Honor. It takes commitment – time and money – to be a dama or chambelan. It means attending dance rehearsals for several weeks, maybe months and its also customary for the honored court members to purchase their gown or tuxedo (plus shoes and accessories) chosen by the quinceanera. 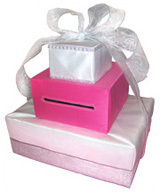 So to show your appreciation of their commitment, a gift is a thoughtful way to say thank you.